Tate Browning bowled well for New Norfolk. NEW Norfolk Under 13s had a good win over North Hobart in the Cricket Tasmania Youth League matches at the weekend, with their bowlers doing a great job. Jack Morgan-Miller bowled just two overs to take 3-8. Tom Murray snared 2-1 off just 1.3 overs while Blake Sillifant 1-3 (1), Cameron McMaster 1-7 (2) and Riley Blackaby 1-10 (2). Well done boys. In the Under 14s New Norfolk had a big win over New Town at Tynwald Park. Jye Bearman had a good match, hitting three fours and eight sixes in his 73. He also bowled well taking 2-21 off four overs. Jordan George made a fine 45 while Jordon Gittus did well also, making 33. Tate Browning bowled well to finish with the excellent figures off 3-8 (6). 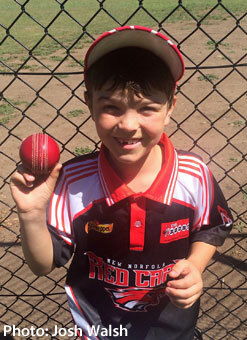 Eight-year-old Tate Browning made his debut for the New Norfolk Under 14s after solid form in the Under 13s. With the weight of the world on his shoulders, he took a wicket while opening the bowling with his first ball. In Gretna's Under 13 match, Aidan Featherstone made 23 while Byron Conley did well to gather 3-31. No scores or stats were available for the Gretna under 14's match. St Anne's 4/257 off 30 overs d. Gretna 8/46 off 14 overs at Cadbury No.1. Batting: Aidan Featherstone 23 (1x4), Kane Lovell 6 (1x4). Bowling: Byron Conley 3-31 (3), Aidan Featherstone 1-29 (3), Jorden Conley 1-31 (4). New Norfolk 7/73 off 30 overs d. North Hobart Demons 8/66 off 12.3 overs at Tynwald Park. Batting: Tom Murray 11 (2x4s), Cameron McMaster 10 (1x4). Bowling: Jack Morgan-Miller 3-8 (2), Tom Murray 2-1 (1.3), Blake Sillifant 1-3 (1), Cameron McMaster 1-7 (2), Riley Blackaby 1-10 (2). Gretna v Kingborough Knights Black at Gretna. No Results available. New Norfolk 8/235 off 39.5 overs d. New Town Bucks 8/137 off 28.3 overs at Tynwald Park. Batting: Jye Bearman 73 (3x4s, 8x6s), Jordan George 45 (4x4s, 1x6), Jordon Gittus 33 (5x4s, 1x6), Jake Stevenson 13 (3x4s), Dylan Browning 13 (1x4). Bowling: Tate Browning 3-8 (6), Jye Bearman 2-21 (4), Jake Stevenson 1-0 (0.3), Jordon Gittus 1-15 (4), Dylan Browning 1-21 (4).